Who would have thought this? For several years, scientists thought the strongest biological material was spider web. 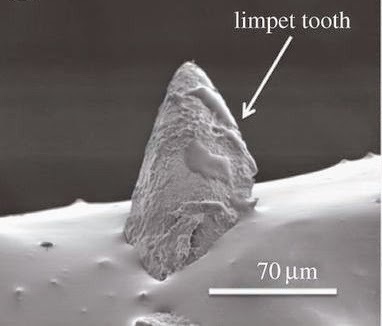 Now it turns out that it is a tooth! A sea snail called a Limpet is the owner of these little miracles... and I *do* mean little. The teeth are only roughly 1 millimeter in height. Tiny but tough. Why are these teeth so strong? Well limpets attach themselves to rocks that are underwater & near the shore. The feed on algae. So when they eat, the scrape their teeth on the hard surface of the rock. Therefore their teeth *have* to be strong. Stronger than human teeth... stronger than any other teeth known to man. Perhaps we can learn something from this. Maybe there's a new really tough material on the horizon. I'll leave that to the researchers, however, this is a really cool & interesting discovery. If you would like to read the scientific paper on the discovery, click here.